Losing a pet is never easy. 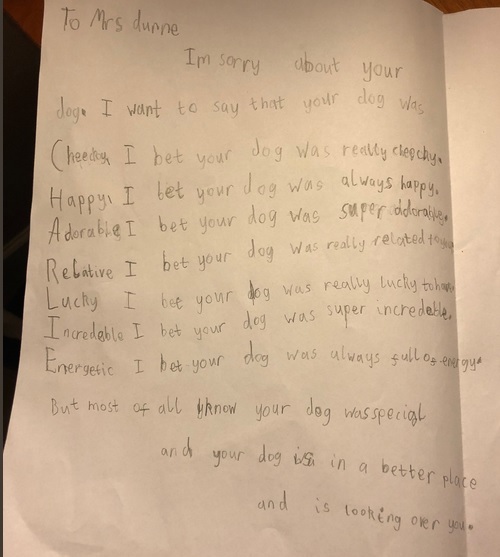 Which is why we’re currently melting over this letter that a teacher got from her student after the passing of her beloved dog. The letter was shared by a woman in Scotland named Lucie Dunne, whose mom works as a teacher — presumably at an elementary school. According to Lucie, Mrs. Dunne was worried about going back to work after having to put her dog, Charlie, to sleep. But she got support from an unlikely place — a student named Callum. As all sentimental gifts come with risks, Callum put a disclaimer on his. "Sorry if you don't like it or it makes you emotional," he wrote. While Callum used words like “cheeky,” “happy,” and “adorable” to describe Mrs. Dunne’s beloved dog, our favorite was the R, for “relative.” “I bet your dog was really related to you,” he wrote. "But most of all I know your dog was special and your dog is in a better place and is looking over you," he wrote at the end. The card went viral, and dog lovers all over Twitter got emotional. We’re confident that the heartfelt letter made Mrs. Dunne’s day. Charlie sounds like he was a very good doggo, and he won’t be forgotten.